We hope to have internet access on the boat again very soon. Thank you MacDonalds for providing free WiFi. You can read more about our Hurricane Omar experience HERE. As you can see, we are a bit different from other brokers... We live full time on our boat and love to see the charter yachts outside of the confines of the formal charter yacht shows. 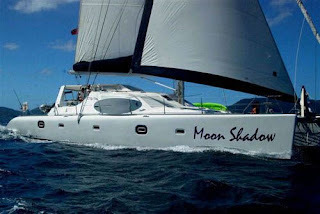 Due to a cancellation, the 4-cabin (8 guests), 58-foot catamaran MOON SHADOW is available for in the British Virgin Islands for a New Years charter beginning on December 28th or thereafter. Looking for a different Caribbean location for your sailing vacation this year? 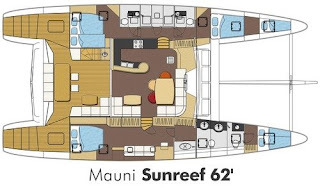 How about a yacht charter in Belize aboard the beautiful 62-foot Sunreef catamaran, MAUNI. As you can see, the large master stateroom takes up most of the starboard hull. The other two guests cabins are located in the port hull. The aft port cabin has a Queen berth with a single pullman which allows flexible accommodations. The forward port cabin has a Double. Sorry, MAUNI is already booked for Christmas and New Years in Belize. This link includes October 2008's password. If you cannot view their brochure, let us know! 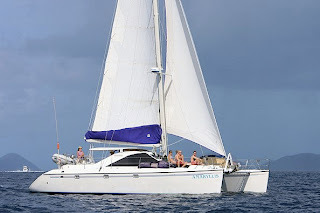 The charter catamaran AMARYLLIS, a 45-foot Privilege catamaran, is offering an early season special! 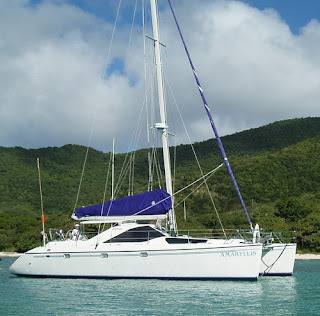 AMARYLLIS is offering a $750 discount for 7-night (or more) yacht charters taking place before December 15, 2008. Currently open for Thanksgiving! AMARYLLIS is ideal for two couples or families of four. Our all-inclusive rate is $10,000. With 20 years experience sailing in the VI, we know we can provide our guests with the vacation they've dreamed of, whether they are first time visitors to the VI or repeat charterers looking to revisit favorite spots and discover new ones. We offer the best in food and drink and a variety of water sports including snorkeling, wind-surfing, kayaking, tubing (for the kids) and a complementary rendezvous dive. The charter catamaran Amaryllis, a 45-foot Privilege, is offering a dive promotion for their 2008/9 charter season. 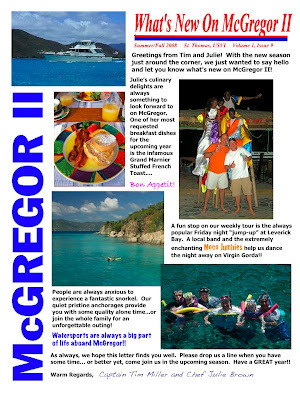 As a promotion for the 2008/2009 season we will be offering our guests a free rendezvous dive. We love rendezvous diving because our diving-certified guests get to go for a two-tank dive with professionals who can give them a first-rate diving experience and we can attend to our non-diving guests, taking them to a beach or snorkel spot or secluded anchorage. It's win-win for everyone. No sitting on a mooring at a rolly dive site waiting for divers. Everyone gets full attention and a day tailored to their interests. AMARYLLIS is a 45-foot, Privilege catamaran that accommodates up to 6 guests in 3 cabins. For those of you who would like to spend the Christmas and/or New Year's holidays aboard a luxury crewed Oyster charter yacht, you are in luck! We still have a few exceptional Oysters available for the Christmas & New Years 2008-2009 holiday season. PLUS BAR/BEVERAGES: Inclusive of the charter fee is the yacht, food, and crew. 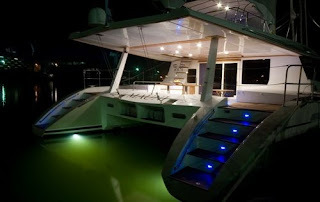 Extra are expenses for bar, communications [your use of the yacht's satellite or mobile phone] , fuel [in excess of four hours engine running time], marina-type berthing, and cruising taxes. PLUS ALL EXPENSES: Inclusive of the charter fee is the yacht, and crew. Provisions for guests, running expenses, including fuel, are extra. HIGHLAND BREEZE is also offering a TransAtlantic charter in conjunction with the ARC: CLICK HERE for previous post. OCTOBER Less than 85 days till Christmas! Well, it's October already! Kids are back in school... Football season has started... The World Series is coming up... Halloween candy in the stores... Presidential debates... Less than 85 shopping days till Christmas!!! Plus, isn't it time to start planning your next sailing vacation? Whether it is a quick getaway for two or an occasion for some family quality-time, contact Paradise Connections and we'll help get the right boat for YOU! There are still some excellent yachts available for Christmas, but New Years has been pretty well booked up for some time... Never hurts to ask though :) We'll see what we can do! Ring in the New Year with Nessie! There's still a couple of cabins available on the Barge Scottish Highlander for their 4-night Hogmanay cruise. Don't wait too long, though... the sooner we can start, the better! We already have bookings for November 2009!